According to the Americans with Disabilities Act (ADA), your service dog must be trained or otherwise able to perform an essential function (major life task) for you that you have difficulty performing for yourself because of your impairment. 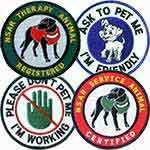 National Service Animal Registry (NSAR) recognizes that you may train your own service dog and will supply you with identification to allow your service dog to accompany you anywhere you want or need to go. As a Service Dog, your animal assistant will be able to accompany you into any publicly accessible area, including restaurants, museums, airports and airplanes, theaters, stores, parks, etc. If not already trained, you can train your own Service dog to meet the specific needs of your disability. 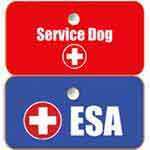 It's important that your service dog is adequately trained to qualify as a service dog. Please review the statements below. If your service can do most of these, then you'll be confident that your dog is manageable in public. 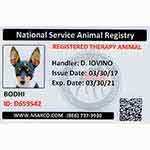 Purpose: The purpose of the NSAR Public Access Test is to ensure that dogs and other animals certified and registered with National Service Animal Registry are stable, well-behaved, and unobtrusive to the public; that you have control over the dog and that, as a team, you do not pose a public hazard. Dismissal: Any assistance dog or other animal that displays aggressive behavior (growling, biting, raising hackles, showing teeth, etc.) or exhibits otherwise unmanageable behavior will not qualify as a service dog. Bottom Line: Your service dog demonstrates that he/she is safe to be in public, and you demonstrate that you have control of your dog at all times. Important Note: We acknowledge that some service dogs are not "on-leash" and are either carried with or without a cage, crate, or other housing. In this case, the only requirements are that 1) the service dog is manageable in public, 2) that you have control over the dog, and 3) the service dog is trained or otherwise able to perform a major life task for you that you have difficulty performing for yourself because of your disability. Commands: Commands may be given to the service dog verbally, via hand signals, or a combination of both. CONTROLLED UNLOAD OUT OF A VEHICLE: The service dog must wait until released before coming out of the vehicle. Once outside, it must wait quietly unless otherwise instructed by the Individual. The service dog may not run around, be off lead, or ignore commands. Essentially, the service dog should be unobtrusive and unloaded in the safest manner possible. APPROACHING A BUILDING: After unloading, the service dog should stay in a relative heel position and not forge ahead or lag behind. The service dog should not display a fear of cars or traffic noises and must display a relaxed attitude. When you stop for any reason, the service dog should also stop. CONTROLLED ENTRY THROUGH A DOORWAY: Upon entering a building, the service dog should not wander off or seek attention from the public. The service dog should wait quietly until you are fully inside, and then should calmly walk beside you. The service dog must not pull or strain against the lead or try to push its way past the individual but should wait patiently while entry is completed. HEELING THROUGH A BUILDING: Once inside a building, you and your service dog should be able to walk through the area in a controlled manner. The service dog should always be within touching distance where applicable or no greater than a foot away from you. The service dog should not seek public attention or strain against the lead (except in cases where the service dog may be pulling your wheelchair, if applicable). The service dog should readily adjust to speed changes, turn corners promptly, and travel through a crowded area without interacting with the public. In tight quarters, such as store aisles, the service dog must be able to get out of the way of obstacles and not destroy merchandise by knocking it over or by playing with it. SIX FOOT RECALL ON LEAD: You should be able to sit your dog, leave it, travel six feet, then turn and call the service dog to you. The service dog should respond promptly and not stop to solicit attention from the public or ignore the command. 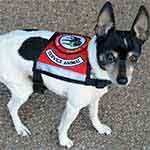 The service dog should come close enough to you to be readily touched. The recall should be smooth and deliberate without your service dog trudging to you or taking any detours along the way. SITS ON COMMAND: Your service dog must respond promptly each time you give it a sit command, with no more than two commands with no extraordinary gestures. DOWNS ON COMMAND: After your service dog follows the down command, food should be dropped on the floor. Your service dog should not break the down to go for the food or sniff at the food. You may give verbal and physical corrections to maintain the down, but without any extraordinary gestures. The second down will be executed, and then an adult and child should approach your dog. The service dog should maintain the down and not solicit attention. If the child pets the dog, the service dog must behave appropriately and not break the stay. The individual may give verbal and physical corrections if the service dog begins to break the stay. NOISE DISTRACTION: Your service dog may acknowledge nearby noises, but may not in any way show aggression or fear. A normal startle reaction is fine (the service dog may jump and or turn), but the service dog should quickly recover and continue along on the heel. The service dog should not become aggressive, begin shaking, etc. RESTAURANT: While seated at a dining table (restaurant or other suitably alternative location), your service dog should go under the table or, if size prevents that, stay close by the individual. If the service dog is a very small breed and is placed on the seat beside you, it must lie down. The service dog must sit or lie down and may move a bit for comfort during the meal, but should not be up and down a lot or need a lot of correction or reminding. 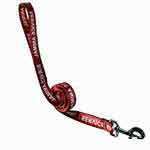 OFF LEAD: While your service dog is on the leash, drop the leash while moving so it is apparent to the dog. 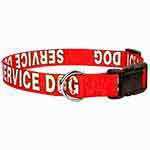 You should be able to maintain control of the service dog and get the leash back in its appropriate position. This exercise will vary greatly depending on your disability. The main concern is that the service dog be aware that the leash is dropped and that the person is able to maintain control of the dog and get the leash back into proper position. CONTROLLED UNIT: When you leave a building with your service dog on leash, the dog should be in appropriate heel position and not display any fear of vehicle or traffic sounds. Click here to register your Service Dog.